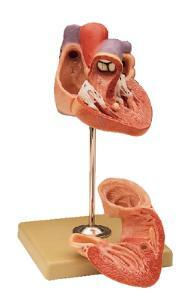 This model reveals the different parts of the heart. Depicted at ¾ the size of the real organ, this human heart model can be separated into two parts to reveal the bicuspid, tricuspid, coronary vessels, and semi-lunar valves. The full-color vinyl model features a pedestal base.